"Since 17 May 1990, seismic stations in St. Lucia have been registering local earthquakes that appear to be of volcanic origin (both A- and B-type events were observed). About 172 events were detected by seismic station SLB (figure 1) from 17 May to 10 June, with peak activity occurring on 19 and 20 May (figure 2). Figure 1. Map of St. Lucia, showing earthquake epicenters 17 May-10 June 1990 and locations of seismograph stations. The broken line represents the limits of Qualibou caldera. Courtesy of the Seismic Research Unit, UWI. Figure 2. Number of seismic events/day recorded by station SLB on St. Lucia, 17 May-10 June 1990. Courtesy of the Seismic Research Unit, UWI. "Hypocentral parameters calculated for 34 well-recorded earthquakes show that events were predominantly clustered ~6 km ESE of Qualibou caldera, near Mt. Victorin (altitude 265 m). Focal depths were in the 10-20 km range and magnitudes were generally <mb 2.5. The largest event, of mb 4.6, occurred on 19 May at 1344 and was widely felt throughout St. Lucia. Two other events had magnitudes between 3.0 and 4.0 and were also felt. "This is the first significant earthquake series that has occurred in St. Lucia since the establishment of a seismic station on the island in 1953, and does not appear to be a foreshock-mainshock- aftershock sequence. The cause of the seismicity is still uncertain but may be due to the intrusion of a small magma body. Temperatures of hot springs in Qualibou caldera did not exhibit any significant variation during the main period of the activity and no episodes of harmonic tremor were recorded." Information Contacts: W. Ambeh, K. Rowley, L. Lynch, and L. Pollard, UWI. The Global Volcanism Program has no Weekly Reports available for Qualibou. 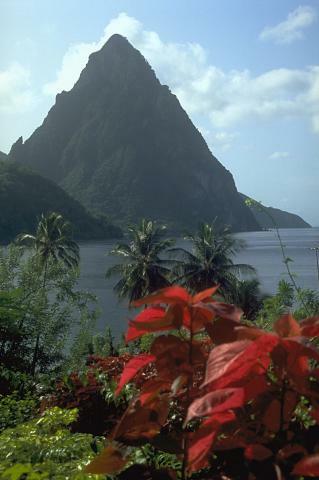 The Qualibou caldera on the SW side of St. Lucia provides the setting for the Pitons, two steep-sided pre-caldera lava domes that form one of the scenic highlights of the West Indies. The 3.5 x 5 km caldera formed about 32-39,000 years ago in conjunction with the eruption of the Choiseul Tuff. A larger depression has been interpreted to have formed by edifice collapse, and bathymetry has identified large submarine debris-avalanche deposits off the west coast of the island. This depression and associated volcanic vents and geothermal areas is also known as the Soufrière volcanic centre. Numerous resurgent post-caldera lava domes fill the caldera floor. The latest dated magmatic eruptions took place about 20,000 years ago, but younger undated lava domes and explosion craters are present. The only known Holocene eruptive activity was a minor phreatic eruption in the Sulfur Springs geothermal area in 1766 CE that ejected a thin ash layer over a wide area. A volcanic earthquake swarm centered 6 km ESE of the caldera occurred in 1990. This volcano is located within the Pitons Management Area, a UNESCO World Heritage property. Lindsay J M, 2005. Saint Lucia. In: Lindsay J M, Robertson R E A, Shepherd J B, Ali S (eds). Volcanic Hazard Atlas of the Lesser Antilles, Trinidad and Tobago, Seismic Res Unit, Univ West Indies, p 218-238. Wohletz K, Heiken G, Ander M, Goff F, Vuataz F-D, Wadge G, 1986. The Qualibu caldera, St. Lucia, West Indies. J. Volcanol. Geotherm. Res., 27: 77-117. There is no Deformation History data available for Qualibou. There is no Emissions History data available for Qualibou. 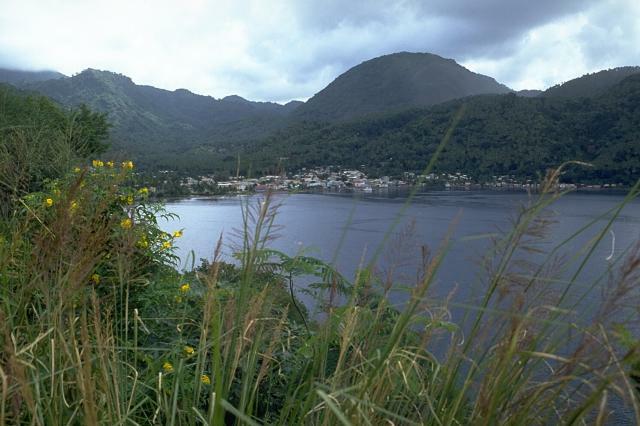 The town of Soufriere lies just NW of the 10-km-wide Qualibou caldera. This view from the NW looks across Soufriere Bay to the rounded Terre Blanche lava dome. The western caldera wall lies between the dome and the gentle ridge behind the town. The ridge in the background to the left of Terre Blanche is the back wall of the 3.5 x 5 km caldera, which was formed during powerful eruptions about 32-39,000 years ago. Photo by Lee Siebert, 1991 (Smithsonian Institution). Hydrothermally altered rocks are exposed over a wide area in the Sulphur Springs thermal area of Qualibou volcano. The thermal area, located in a valley SW of Terre Blanche lava dome, contains 11 hot pools, some of which occasionally produce small steam-driven fountains about 1-m high. Sulphur Springs was the site in 1766 of the only historical eruption of Qualibou. A small explosion deposited ash and cinders over a wide area. 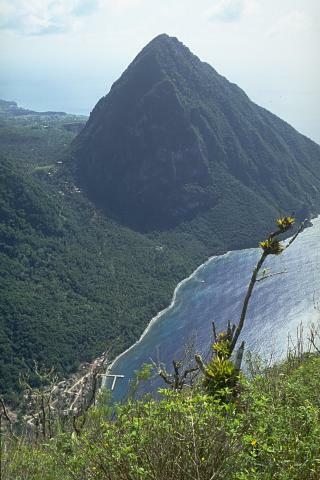 The steep-sided pyramid of the Petit Piton lava dome, the northernmost of St. Lucia's renowned Pitons, rises to the south above Soufriere Bay. The dramatic peak is the eroded plug of a dacitic dome that was emplaced about 250,000 years ago. The 743-m-high dome displays nearly vertical flow banding on all sides. 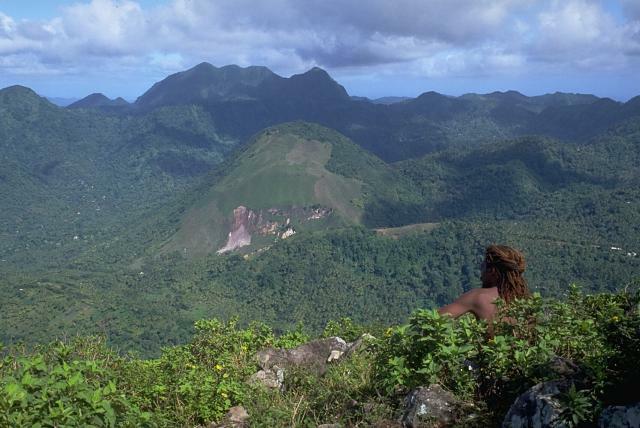 Emplacement of the Pitons preceded formation of the Qualibou caldera about 32-39,000 years ago. 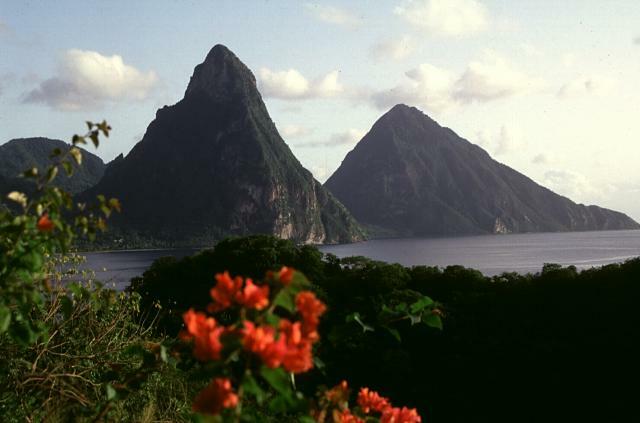 The Pitons, the dramatic landmarks of the island of St. Lucia, are the eroded plugs of two Pleistocene lava domes. Gros Piton (left) and the even steeper Petit Piton (right) are pre-caldera lava domes west and SW of the late-Pleistocene Qualibou caldera. The lower ridge in the right foreground is the SW-most of the 3 Bois d'Indie Franciou andesitic lava domes. They were constructed along a NE-trending fault. The rounded Terre Blanche lava dome (center) was constructed within the 3.5 x 5 km wide Qualibou caldera. The dome is seen here from the summit of Petit Piton, a pre-caldera lava dome, with the skyline ridge forming the NE caldera wall. Andesitic lava flows and breccias are exposed in the caldera wall. The 450-m-high Terre Blanche dome is one of 3 dacitic lava domes that grew following formation of the caldera about 39,000 years ago. Gros Piton, seen here from the summit of the Petit Piton, is the southernmost of the twin lava domes that are the hallmark of the island of St. Lucia. The 777-m high and 3-km wide dacitic dome was erupted about 260,000 years ago. Rocks of a small tuff ring are exposed at its base. The twin lava domes of the Pitons rise above Soufriere Bay on St. Lucia, forming one of the scenic highlights of the West Indies. 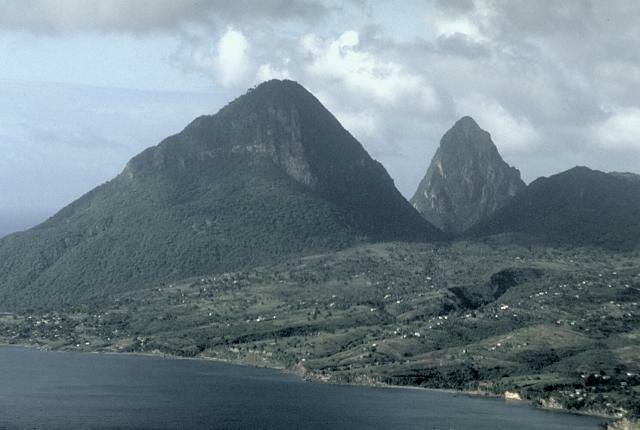 Petit Piton (left) and Gros Piton (right) are the eroded plugs of 250,000-year-old dacitic lava domes preceding formation of the 3.5 x 5 km Qualibou caldera about 32-39,000 years ago. 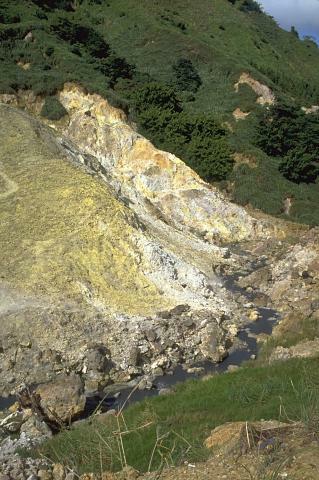 The only known Holocene activity at Qualibou was a minor phreatic eruption in the Sulfur Springs thermal area in 1766 CE that ejected a thin ash layer over a wide area. The Global Volcanism Program has no maps available for Qualibou. There are no samples for Qualibou in the Smithsonian's NMNH Department of Mineral Sciences Rock and Ore collection. Large Eruptions of Qualibou Information about large Quaternary eruptions (VEI >= 4) is cataloged in the Large Magnitude Explosive Volcanic Eruptions (LaMEVE) database of the Volcano Global Risk Identification and Analysis Project (VOGRIPA).